International Journal of Research in Health Sciences,2014,2,1,359-362. 1-Assistant professor. 2,3-DNB Resident, Department of Orthopaedics, NIMS Medical College & Hospital, Jaipur, Rajasthan, INDIA. Introduction: Isolated elbow dislocations are uncommon in children. So children presenting with elbow dislocation should be carefully evaluated clinically as well as radiologically. Neurological or vascular injuries may also occur conjointly. Case presentation: A 15 year old boy presented with severe pain and swelling around elbow with history of fall on extended elbow. Patient was having hypoesthesia over whole palmar aspect of the hand with weakness of both flexor and intrinsic muscles of hand. On plain radiograph there was dislocation of elbow which was reduced immediately .On post-reduction radiograph there was a fragment visible inside the ulnohumeral articulation which was found to be fractured fragment of medial condyle on CT scan. Fracture was exposed by medial approach and bony fragment was found to be attached with the flexor muscles and entrapped within the ulnohumeral joint. Fractured fragment was reattached to its anatomical position using two smooth 1.5 mm kirshner wires. Elbow was immobilized in posterior splint with elbow in full extension. 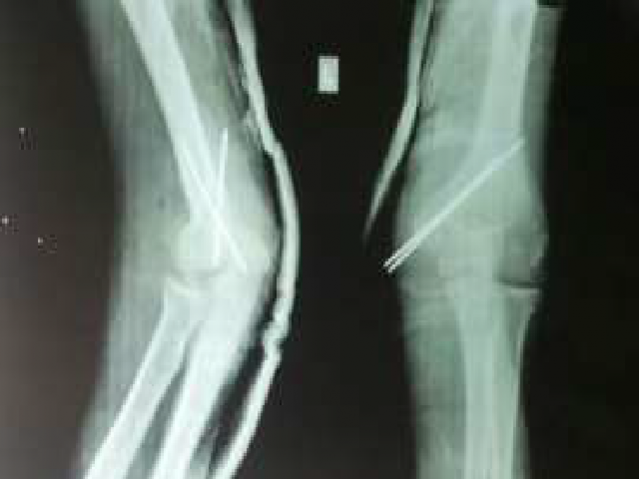 Wires were removed at three weeks follow-up and mobilization started. Neurological symptoms disappeared after 3 months. At final follow up after 18 months patient was having full range of motion without any elbow instability. Conclusion: Isolated elbow dislocations in children are uncommon. The dislocation should ideally be reduced under general anaesthesia as early as possible with radiological modalities to avoid delay in accurate diagnosis. CT scan may aid in diagnosis if there is any doubt regarding the position and displacement of the fractured fragment.